Hello, I'm Siobhan and I'm a Blush Addict... I should probably go to some sort of support group to curb my incessant need to keep buying blushes. I mean, I only have two cheeks! 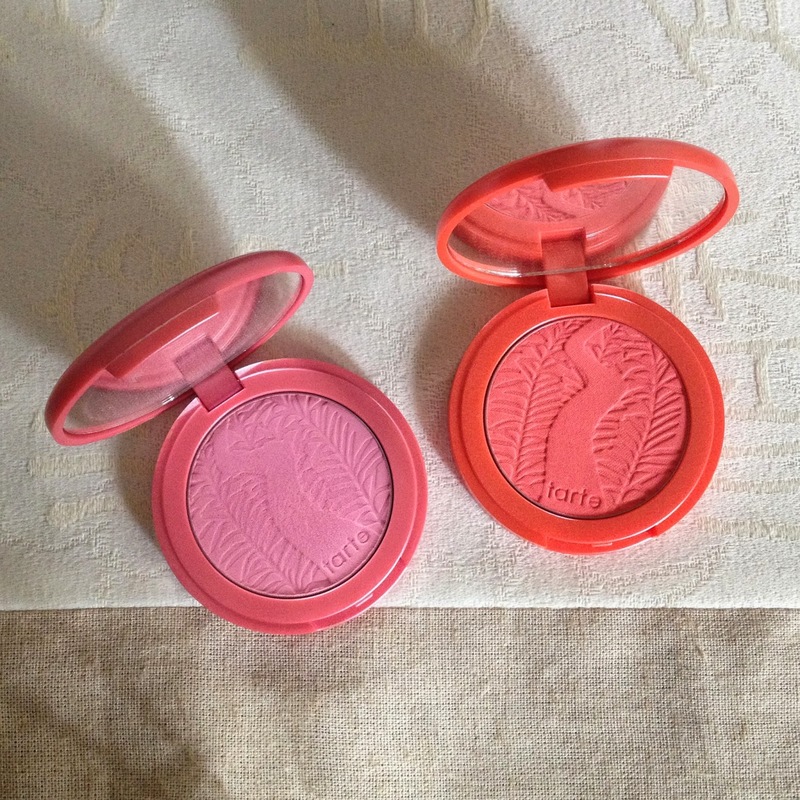 Today I have two of my newer additions to gush about - two cult favourites: Tarte Amazonian Clay 12-Hour Blushes in the shades Tipsy and Dollface! These blushes have been around forever and they have a lot of hype around them. At first glance, they are really adorable and I've always been drawn to their packaging. I really appreciate when a product's packaging is the same colour as the product within it - it makes my life way easier when rummaging through my overflowing blush draw trying to find a particular shade. I believe Tarte is releasing these same blushes in new packaging that doesn't have any frills or decorative bits - sleek but a bit boring. The formula for these blushes are supposedly sun-baked and nutrient rich to create smooth, long-wearing colour. In terms of formula, I think these blushes really deliver. I can't attest to the "12-Hour" part, but they do last allllll day, especially if layered over a cream blush. For a powder blush, they don't look particularly powdery or cakey on the face. The pigmentation is phenomenal - Dollface is a bit easier to wear and build up, whereas caution is definitely needed with Tipsy in order to prevent clown-face. Dollface is a cool-toned classic pink that I reach for all year long and really does create pretty little doll cheeks. It's also completely matte. Tipsy is an orange-based coral with slight shimmers (although it definitely does not look glittery). I love this in the summer with a tan and a coral lip. It's fun and colourful but also natural at the same time, it really brightens up your face. Overall, I plan on grabbing a few more of these bad boys when I can find an excuse to buy more blush...They're great quality, come in beautiful shades and packaging, and at $31 a pop, they are middle of the road for high-end blushes.